The story last week was more than VP Debates and Bailouts. 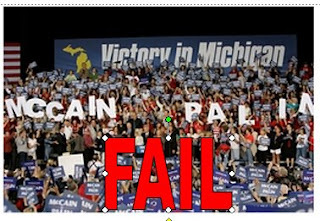 In terms of this year's election the real story was The McCain campaign bailing out of Michigan and moving his personal goal post to PA. and FLA. The Guardian has a great little 101 piece about why this is important. But beyond basic math this is important symbolically. McCain is conceding ground, which has got to be a big ego slam to him. The last two weeks have seen very little go right for team McPalin. She held her own in the debate yesterday, but did not gain ground. The news about Michigan broke on the same day. McCain got a pretty dramatic black eye in the bailout mess of the last 7 days. AND his signaling that Palin would give even less access to the media is not going to give him any press pillows to fall down on when he stumbles. The fight is going to get more intense in Florida for sure. (damn?! Florida-- Again???) but he is showing his weak, white, pasty, underbelly an awful lot recently. It is no time for us to be over confident, but it is nice to see a little good news on our horizons.